Administrators can change the user information and permissions for each user. Here we will show how to do this. On this page, we will explain the procedures for changing one user at a time and for changing in bulk. If you would like to see how to change user information of multiple users at once, see here. This function can only be used by those with administrator level permission. When the changes are done, a notification of the content of those changes will be emailed to the relevant user and the system administrator. User IDs cannot be changed. There is a way to change individual users one at a time and a way to change multiple users at once. After permissions have been given, please log out and then log in again. Depending on the contract you use, permission functions with a star next to them are charged. If you have any questions about the content of your contract, please speak to a sales representative. *User IDs cannot be changed. * The start of usage date can be changed if the date is today or later in the future, but cannot be changed if otherwise. (※ 1) To set someone to be a deal management administrator, put a check in both Regular user and Administrator. * For details about each item, see here. 1. Click on "Admin Settings", and then "Add / Change User". 2. Click on "Change" next to the user. 3. Input the items you wish to change and then click "Save". 4. A pop-up to confirm the contents of the changes will come up. If the changed contents are correct, click "OK". 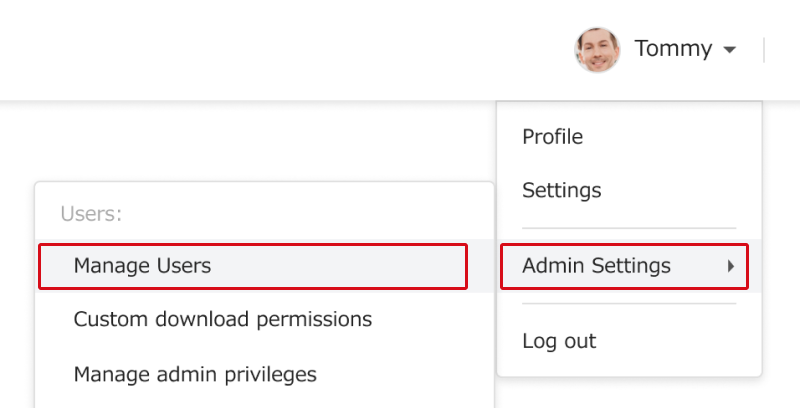 1 Click on "Admin Settings", and then "Add / Change User". 3. Input the items you wish to change, and then click "Confirm" at the top of the screen. 4. The items you changed will be displayed in red. After confirming them, click "Save". -Users will need to log out, and then log in again for these changes to be reflected. -The changes will be reflected to the user names and departments when you press "Sync with center" at the upper right of the screen.